The Tulip-Wood H6C Hispano Suiza Click on the Galleries above to view all the photographs. We heard no more of the car for about two years, other than it had been completed and sold. 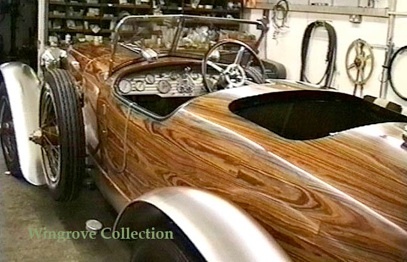 Then I received an e-mail from San Francisco asking if I would build the writer a model of his Tulipwood Hispano Suiza. Knowing that the original car did not live in that town, and having previously booked flights to be in the area in a couple of months time, we arranged to meet. Imagine our delight in seeing Roy’s creation again and finished in all it’s glory. Well not initially. It had been finished and he would have been delighted with the workmanship, but what had they done to it. Who ever had completed the car for the sale room, had STAINED that beautiful Tulipwood to a dark brown, and PAINTED those beautiful polished aluminium fenders, that he was so proud of, a metallic mud/copper colour. The new owner had no idea of my previous connections with Roy Middleton and the car, so was delighted to hear the story and have copies of the photos of the building of it. He also said that he would have the car stripped, the stain removed back to the original finish and the fenders put back to polished aluminium. I do hope this has been completed and Roy may rest in peace having built the only Tulipwood H6C Hispano Suiza in the world, and it is as he designed it. Needles to say I was delighted to be asked to build a model of a full size car that it’s self had been built from my own body modelling plans, but how to reproduce the wood grain. For the Honduras Mahogany I had always used pearwood, because with the very fine grain, I can simulate a scale mahogany. Now I have been a long time collector of hardwoods, and it so happen that I had a large piece of Tulipwood timber. On close inspection of the end grain I noticed a ‘blip’, that gave me the idea, that should I be able to slice this with a very fine saw, I might just be able to reproduce the graining of the full size car to something like a scale of 1/15th. Rosewoods are, like pearwood, very dense and fine grained, so there was no problem there, however, with just one ‘blip’ I thought I might be hard pressed to get enough veneers to complete the body work. I found a timber merchant in the south of England who had a stock of Tulipwood blocks, like the one that I had, so I checked them all out and found two others with a similar ‘blip’ in them. This was just enough to provide the veneers for the one model. Click on the Galleries above to view all the photographs. Little is known about the car after this, until it was discovered in the back of the ‘Hoopers’ (coach builders) warehouse in London in 1950, and then purchased by an enthusiast. The swept fenders were apparently missing, so a set of cycle fenders were made for it and it was used for touring Wales and Scotland. In 1956 she was sold to a new owner who undertook a complete restoration. Not liking the cycle fenders, he commissioned a Thames boat builder to fashion the current helmet style fenders over the original smaller ones, in the brass-pinned and planked style of the body work. The car now resides in a car collection in California in a ridiculously over restored state, such that it is all but unrecognisable. When I first visited the car she had a patina on the woodwork of an old, but loved and well used grand piano, and the character of a grand old lady who has seen a thing or two. Now with the interior in cream leather, every scrap or metal either chrome or copper plated, the under-tray now made of polished copper, (of all things), and that glorious antique wood finish stripped back to the bare wood and painted in a high gloss plastic finish, it now looks a total monstrosity. I was commissioned to build the first model of this shortly after an article on it appeared in Automobile Quarterly that included several full page photos of her. In the photos the finish on the wheels looked like old gold, rather then the then, very tarnished red copper plating that was their actual finish. I suggested to the then owner that the model would look much better with the wheels plated in a red gold rather than in tarnished copper and he agreed that the model should be made that way. This was my third model in 1/15th scale with engine detail and like the Duesenberg the subject was to become part of my life for over thirty years, with 18 models being built in that time in various forms. This H6C Hispano Suiza, was built for Andre Dubonnet in 1924 by Nieport-Astra, better known at the time for its fighter aircraft. It was designed by Henry Chasserio, with instruction for a lightweight racing body of no more than 100lb. The techniques used for the construction of the body were similar to those used for the aircraft fuselage at the time, with a light rib and frame work but covered with three layers of thin timber rather than fabric. 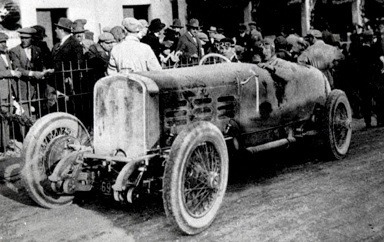 Dubonnet raced the car in the 1924 Targo Florio and came sixth from a starting field of 37. Apart from several photos showing the car in racing trim without fenders, there are others that show it with a set of swept fenders, possibly taken in early 1924. These being only black and white photos there is no way of knowing what the colour of these were, but the wheels also match the fenders and under-tray. As it was common practice to paint wheels silver, I have taken the fenders to be aluminium, and the under-tray and wheels to be painted silver. In late 1924 the car was exported to England and appears to have visited the Brooklands Motor Racing circuit, as there is a dated photo showing it in the parking area. This shows the car fitted with a slightly different set of swept fenders, which together with the under-tray and wheels now appear black on the black and white photograph. The B&W films of this period would also show red as black, however, after discussing this with several others more familiar with these things, it was agreed that the colour of the fender, under-tray and wheels, was most likely black. Also clearly shown in the photo is a fitted luggage rack over the rear section of the body and a lever outside the body on the drivers side and to the rear of the gear change, for dipping the head lights. In 1978 the first edition of my book ‘Complete Car Modeller’ was published, on the cover of which was a picture of my model of this H6C Hispano Suiza. No sooner was it out than a Mrs. Middleton purchased a copy for her husband as a Christmas present, thinking the book was about Hispano cars, he being an Hispano Suiza enthusiast of the first order. A couple of years later I happened to be in London with the second model that I had built of the car, but this time with the aluminium swept fenders. The model was on show in a glass case at the Model Engineering Exhibition, where I was in attendance on the final day. Several times during the day I would notice this fellow coming back repeatedly to the glass case and closely examine the Hispano model. It was not long before we got into conversation, when I learned the story behind his interest in the model. He was Mr. (Roy) Middleton, who owned several real Hispano Suizas cars together with a 1924 H6C chassis, on which he was in the process of building a full size replica of this body from the plans in the back of my ‘CCM’ book, and he had fallen in love with those glorious swept aluminium fenders. We became great friends and I gave him copies of all my research material, and watched with fascination the progress of his creation. The car is popularly known as the Tulipwood Hispano Suiza, and it is/was assumed that the Tulipwood referred to the timber from which the body is made. Roy was also a boat enthusiast, and owned and had restored a large steam launch. He knew something of boat construction and had contacts in the trade so had set about building the body for the car after boat building practice. The body was built of 1 inch square mahogany and to have a tulipwood veneer finish. 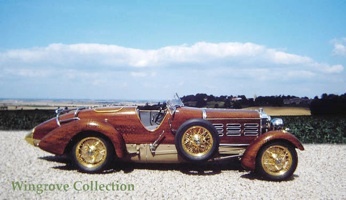 However when he started to get the samples of tulipwood in from the suppliers, they looked nothing like the timber on the full size Tulipwood Hispano Suiza car. He was later to discover that the body is in fact planked in Honduras Mahogany. The ‘Tulip’, it would appear, is a style term, referring to the tulip (pointed) shape of the rear of the body.